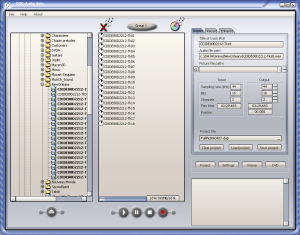 DVD-Audio Solo enables users to create great sounding DVD-Audio discs on their Windows personal computer. The integrated DVD-Audio authoring application for Windows PC to create great sounding DVD-Audio discs from audio files, CDs and recordings. Enjoy high-resolution and 5.1 surround music at the best available DVD quality, well beyond CD and DVD-Video. The only hardware requirements are a standard DVD writer and a DVD player supporting DVD-Audio. The 2.4 updated product line is available for download. It corrects potential issues with upsampling of mp3 and FLAC files.